aluminium, steel, black, screen size: up to 24"
Ergotron - the world-leading brand name in multi-display and multi-functional monitor stands is now available to you from Lenovo. 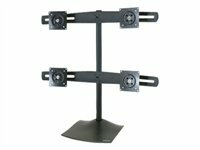 Conserve desk space by suspending four flat panels on a single base. Easily view multiple screens at once to increase productivity.